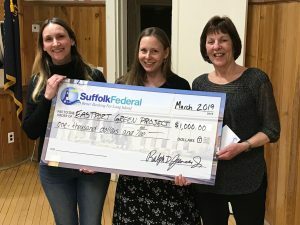 In an effort to support the charitable work of local organizations that serve the areas of Suffolk Federal branch locations, the credit union has identified nonprofit organizations to provide financial support to. In Eastport, Branch Manager Laura Sferruzzo presents a $1,000 contribution to The Eastport Green Project. Pictured left to right: Heather Spagnoli and Stephanie Turano, Co-Founders of Eastport Green Project and Laura Sferruzzo, Suffolk Federal Eastport Branch Manager.